Recently, I saw so many friends asking online for WhatsApp requests or how to use it. It's kinda frustrate me a little, because WhatsApp doesn't have a version in Windows Mobile 6.5 that I own, and I have spent my money for something else, not for a new Android phone. So, I just got an idea... why can't I use it on my PC? Since it uses internet(Edge/3G) to chat anyway, it is possible to use a PC to do the same thing. Then, I started asking around about how the software works. Seems WhatsApp needs also a mobile phone number to register and as a redundancy when offline. If it's just that.... it's now possible to do. 1. Install Android SDK. The default installation path is at "C:\Program Files (x86)\Android" but it seems to have a little trouble after installation because it is difficult to type a path name with " "(space) in between. I recommend to use "C:\Android" for installing path, or use a DOS command "makelink" to create a link from "C:\Android" to the installation path. I won't cover the installation process here. 2. After finish installing, "SDK Manager" program would popup, if not, open it from Start-->All Programs-->Android SDK Tools-->SDK Manager . This tool is for managing which version of Android will be installed in the system. You can choose to install all the Android versions available, but it would be a long time for downloading. I recommend installing only what is needed. For this tutorial, I'll use only Android 2.3.3 API 10. 3. When the SDK Manager finish updating and installing, it's time for setting up our emulator. First off, go to the "Virtual devices" tab on the left, and hit "New..."
4. On the new emulator window, type emulator name as you want (in this case "TestAndroid"). Set the "Target" and SD card size, then hit Create AVD. 6. When the Android Virtual Device started properly, open the web browser(on the device) and go to www.WhatsApp.com (you can click on Google searchbox and type the URL) and download WhatsApp program and install it. Download WhatsApp.apk and install it. 7. Open WhatsApp, it'll ask you to type in your phone number. It'll send you a text SMS to verify that is really your number. You have to type your real phone number here. 8. You have to wait for awhile for the SMS message arrive to your own phone. The message will look like this. Issue a command "sms send <phone no.> <message>"
This tool is supposed to query all the phone contacts in the phone to add in WhatsApp, but too bad that I couldn't create a contact in this device just yet. Anyway, what you can do is waiting for friends to add your phone number and see you online. And it's working! run command "adb install d:\WhatsApp.apk" (without quotes), where d:\WhatsApp.apk is where the downloaded file is. Then wait until it completed. go to the emulator, and perform the steps 6-9 above to install the app normally. I'm stuck at Step 6. It is in loading state. Mine takes really long time too (like 5-10 min) before pass that screen. hi quick question. Are you able to type with the keyboard, or do u need to physically select each letter with your mouse? may i ask this will charge my mobile money?? is there any link for down. android market...?? it doesn't charge mobile account anything. it totally runs using internet. but can u please tel me how can i import files to dis app so dat i can share them on whatsapp?? to upload a file to AVD, you can use a command from Android SDK directly on Windows command line. but dropbox app is not downloadind in my AVD, how can i transfer files from my AVD to my pc. Hi .. Please help me how to put it on the shortcut whatsapp? everytime i launch WhatsApp iam loosing the internet Connection. why? Worked great man. Thank you very much. And for adding contacts, you have to add them into your phone account just as you do it in a real phone. Then they are automaticly added to whatsapp. Congratulations on your work. Easy steps and very well explained. It works nicely. Thank you very much! how to use putty ?? mine i cant hear sound come out. damn why cant the whatsaap be install..
Will normal usage of whats.app always take so long to startup via AVD??? I oledi download whatsapp, but i cant install it. y? same problem here... whatsapp installation failed, application not installed..i tried with other versions of android, still the same outcome.. I received the same problem when try to install whatsapp using the emulator (The download was ok). application not installed. how do you solve this problem? You're right. I'm sorry I forgot to mention that the emulator has to be running at that time you run the command. IT WORKED MATE!!! thousand thanks...but now, how do u put sounds into the app? cos, when i get notifs, i dnt hear them...any help abt this? thanks!! I did everything you state here, even with the new proceure due to the changes and I kept the emulator running. But I still get the notification: "application not installed" and only the Done button. The only thing I did not do is download the Dual screen API, Real3D by LGE, EDK 1.2 by Sony and Google API From Android 2.3.3 (API 10), because it took to long downloading. Could this be the problem?? Wonderful post, thank you so much! Put the file into your platform tools map, run the cmd line "[the path you put the file into] (for example: C:\Android\android-sdk\platform-tools>adb install WhatsApp_Messenger_v2.6.7814.apk) and press enter. Then it installs itself. Good luck! Hey Dude, this is an Amazing topic .... working great .... even by emulating a Galaxy Tablet (Android 4.0) ... and by the way the idea of using dropbox is like waaaaaaaaaaaw cuz u can upload all your contacts up there and grape them direct to the to your AVD ...... Thumbs-up dude .. But then the Verification of my Phone Number is not working. I tried it several times but i get no activation SMS with an activation code. When I click the "Send Button" for the Verification SMS, it stands still there: Sendig an SMS to XXXX (My Phonenumber), Please wait a Moment. But the nothing more happens. So is there any other way to make an activison of whatsapp? Same as the above poster, it tells me that the whatsapp version is too old an can't use it. Any suggestions? Same as the above 2 posters. It was working great for several months using the old version that was provided via Mediafire. Now it says that the version is too old and that you have to update and Whatsapp refuses to work. 1. Is is possible to fake the old version so that it looks like a newer version? 2. Or is is posible to be able to install a newer version somehow using the emulator? WhatsApp-Messenger_v2.6.9656-androidls.com.apk this version is worked properly .try this version and follow the above steps. the SDK platform from is Android 2.3.3 (API 10) enough? correction: Is the SDK platform from Android 2.3.3 (API 10) enough to download? It wont install whatsapp..what do I do? Maybe you should try Wheebop. 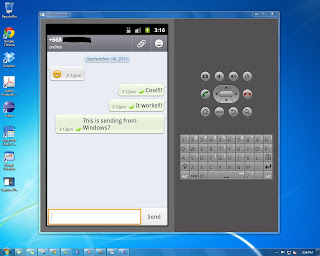 It allows you to send messages from your PC to any Android device. No need for a SIM! Brilliant !!! it works so nice !!! one can go to mediafire link straight thru ur browser in emulator, download and install it, as u wud do from whatsapp site. guess cant use it on emulator anymore! I install Whatsupapp in emulator but now when i stat application it says WhatsupApp version is old and ask me to update to new version. When i tried installing new version it failed. Any idea? Create AVD using Google API 10, start this AVD and install WhatsApp.apk on this device. Tried all version of whatsapp.apk, but still not pssible to install! Either doesn't download, needs an sd card or doesn't install. Anyone knows how further? Hi, I followed the entire procedure. Since the latest whatsapp version does not install on the emulator, I installed the old version posted here. Is there another method ? First create AVD with Google API 10 and run the AVD. Second open Cmd for calling adb. We can use command push for copy file WhatsApp.ap k to SD card and install it with file manager or use install command and wait until succes. Third follow step 7 ~ 10. Thank you for reading my blog. The blog post was published originally on September 2011, and got a lot of attentions since. Thank you again for this. I want to honestly state that, after I posted this blog I already moved on to do other things else. I rarely come back to the same blog post and do an update on it. So I'd say, "The method in this blog will not work anymore. Please move on." Dear All! This still works! I am running it right now talking to a friend of mine in real time. The trick is that one you download the old version of Whatsapp hosted by Anidear, you just need to set the date on the Android emulated device to be September 2011! Follow his guide to the letter (including downloading the older whatsapp version and telneting to your virtual android) once done, whatsapp will say it is too old a version and will shutdown. NOW CHANGE THE DATE ON THE ANDROID DEVICE TO SEPTEMBER 2011!!!!! restart Whatsapp and see the magic happen! Thank you! it's true! it works :D Thanks Anonymous! its true! this still works like described! if you dont get a sms code, try the next step, getting a call with the code, worked for me. Just one thing I wanted to mention! The mod works as i described above if you put the date back to September 2011. Also one thing that bothers me is that there is no ringtone/sound when receiving messages.... if anyone knows how to fix that, please let me know! Would you mind if i rewrote this guide on my own page? I ask since you are the one who came up with the original "hack" and I don't wanna rip off other peoples work. However as you may have noticed, many people seem to be having issues following your guide as it is a bit outdated and somethings have been pointed out by comments as not being detailed enough. (also i think i read somewhere that you were stopping support on this guide). Anyways, I have been having a bit of fun getting this thing to work and would like to help others enjoy whatsapp on their pc's. It works. I try changing the date to September 2011 but the errore message still appears. You must create new contact from Home (MENU button from right pannel), add cell number, then when you open the contact, you select "WhatsApp" and from here it works, also with current date (March 20, 2012). have you used the custom version uploaded here? As mentioned in his update, the new versions won't work. Then launch a command prompt window. (go to the start menu and search for "cmd.exe". 4. wait untill the installation is completed and you will see the whatsapp icon appear on the homescreen. who I write in different language with my computer keyboard? It says I need to download a new version of Whatsapp. i cant open sdk manager what should i do ? I get stuck at the point when i start my avd it opens the android screen and then the black thing on the left keeps having android on it and i can't type. what should i do? can i use any other android app in this emulator ????????? When I try to download Whatsapp into the AVD, it says that the webpage isn't available. Any suggestions? Android works very slow, so using WhatsApp in this way is really .. "boring". Any suggestion? It's my system fault (XP Pro on AMD Turion(tm) 64 X2 Mobile)? having problem in Step 2..
jus to confirm that the instructions still work. and if the error pops up about whatsapp being outdated, just press Esc! Its much easier to install and use Whatsapp on PC with BlueStacks. Just wanted to confrim: IT WORKS! it has to be WhatsApp.zip not apk bc the downloaded file is a zip file. Thanks alot for this nice guide! Hey trying to make this work right now, but will be it possible for me to "Send" and "Receive" messages from both my phone and the emulator ?!?! I tried it, the WhatsApp is up and running (old version) on the emulator. I verified using "Phone Call". However now I cannot use my WhatsApp on my real phone. I want to be able to use it both. It worked for me. I installed first the mediafire version and then updated from within android. cheers. here's another easy guide here www.whatsappforpc.wordpress.com It gives the links to the software needed. Whatsapp works great nw. Thank you so much. This post give me a great help. I can use whatsapp now..this is great since my phone not support whatsapp....the one and only samsung wave bada OS...thanks again..
anybody can get SMS ? mine stuck at sending SMS. can't go through. I changed the date to September also. 5. run command "adb install d:\WhatsApp.apk" (without quotes), where d:\WhatsApp.apk is where the downloaded file is. Then wait until it completed. question , if i us this way to open whatsapp, can i keep the one i'm already in my phone ? like have 2 whatsapp in both computer and phone ?? There is another free way if you dont want to purchase YouWave i found the info on whatsappforpc.com thay talk about a smaller install and adding contacts. it worked for me and was pretty easy. thanks for he Post, it worked on in just one go. Hi I have completed all the steps successfully. Now when i open the application and try to register it says the version that i am currently using is too old. I have read all the comments, guides and advice in this thread and i have tried it all including changing the date. But i am stuck at this stage. Kindly help me. can you share the way how you solve this problem? i am stopped by the same problme. whatsapp told me the version is too old. I tried downloading latest Whatsapp app on Android Emulator. tried to install the old version after changing dates and also the latest version. but no go..
why you need skype installation in emulator when you can use it on PC directly? Hai everyone! need help here, why cnt my emulator connect to the internet? I mean the part where you have to verify ur phone and they'll send u a msg, I cnt do it cause it says that my phone is not connected to the internet. help plsss!!! hi , how i can work with wifi connection ....when i turn on wifi it gives error !!! hey, it says that my whatsapp version is too old. what am i to do? do you have the problem like whatsapp's version is too old? it says u nedd an sd card!!! how to use that telnet command or putty?? how can i set the local host? thanks for the information.. Is it important to download all all the packages of 2.3.3 API 10. Hello everybody! I followed this post some months ago, and used Whatsapp on SDK and even on Android-x86 until I bought an android phone. Today we have an alternative to SDK that allows to install Whatsapp without problems, its called Bluestacks and is very easy to use. (Also, with a launcher can be restored as stock Android), try it, its still free as is in BETA! PANIC: Could not open: C:\Users\Utilisateur\.android/avd/DeodatBok.ini"
Then....nothing else happens! I just have a "close" button to close the tab and go back! wow!!!!! u'v doubled the laws of AWESOMENESS! i want to install whatsapp aoolication direct to my laptop so it is possible ? And Use this Method to Add Contacts to Whatsapp on PC..
Hello, i have followed all the steps and have downloaded whatsapp but it is showing download unsucessful due to internal storage memory. please guide me.